Context: Periodontal plastic surgery can help people improve their lives by addressing aesthetic parameters of their smile. Much of what comprises a beautiful and appealing smile is influenced by emotion and personality; however, many structural elements of a smile can be improved through surgical intervention. Evidence Acquisition: The end result often lends significant support to people who wish to experience more effective and successful communication with others in personal, social and workplace situations. 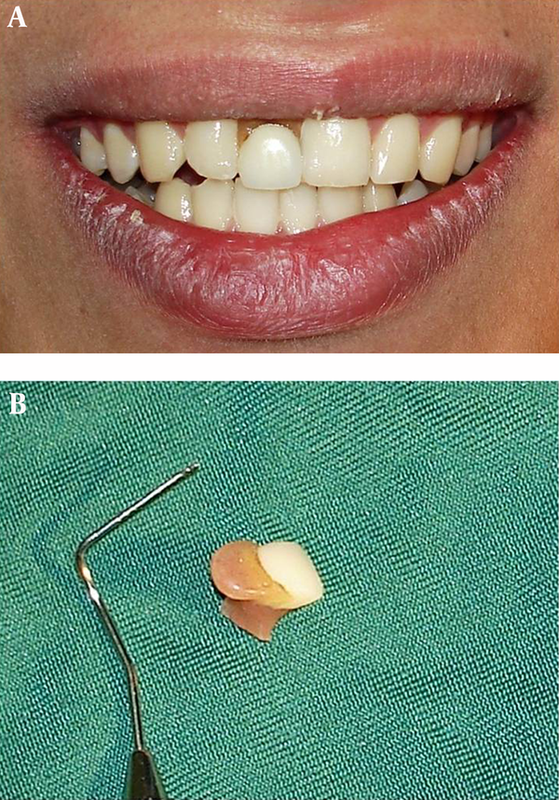 This paper discusses the basis for periodontal surgical interventions in smile enhancement. The anatomical features that contribute to smile appearance and the act of smiling are reviewed. Illustrations of the periodontal plastic surgery cases are presented. Results: Standard measures, golden proportions, and symmetry are concepts that mostly applied for guidance of image designing. Nevertheless, aesthetic attainment is possible with the presence of different measures and proportions and symmetry or asymmetry. Specific mathematical measures and symmetry should not be considered as beauty criteria and the violation of computational formulas and asymmetry should not be introduced as inconsistency. Symmetric smile, which follows proved measures, is not necessarily aesthetic. However, measures, proportions, and symmetry are all aspects of beautiful art work but rarely suffice for attaining beauty phenomenon. Conclusions: In modern society, we insist on finding a form that follows determined rules. Medical and periodontics sciences can have rules in repair and reconstruction of the beauty and health by anatomic symmetric smile principles. Nonetheless, physicians may not be able to achieve beauty despite of applying most complete world standards. Countless individual differences in facial features lead to achieving countless outcomes in aesthetic proceedings. Eventually, individual’s kindness and personality can create a wonderful attraction while smiling that is unjustifiable. Periodontal plastic surgery can help people improve their lives by addressing aesthetic parameters of their smile. Much of what comprises a beautiful and appealing smile is influenced by emotion and personality; however, many structural elements of a smile can be improved through surgical intervention. Periodontal plastic surgeries are the treatment methods aiming to correct anatomic, developmental, and traumatic defects of the soft and hard tissue of periodontium (1). Depth and arrays of lip shadows, fine and trivial differences in mouth and soft tissue colors, and amount of gingiva and teeth visibility while speaking significantly change following some kinds of periodontal plastic surgeries. The philosophy behind the periodontal plastic surgery is beyond the aesthetic purposes and related to the promotion of the quality of life and psychological well-being of individuals. Appearance with low-level emotion and self-esteem can disable a person through influencing interactions. Although determination of sequels of inelegance is not easily feasible, it has been accepted that unattractive or unpleasant appearance can affect individual’s emotions, activity, living, and interactions (2, 3). Furthermore, most of the periodontal treatments that may finally bring aesthetically excellent outcomes are primarily performed to solve issues such as root sensitivity and gingival inflammation. In this article, anatomic features that directly involved in smile structure are discussed. Although human can interpret a smile in a moment, analytic or scientific description of smile is a complex problem. Undoubtedly, facial appearance which is influenced by expressions and physical structures also affects smile (4). Leonardo da Vinci created the mysterious Mona Lisa smile and his work on shadows has attracted art lovers for centuries. When observer look is attracted toward eyes and other parts of the face while observing Mona Lisa smile, an image seems to be vivid and communicates with human. Harmony in all parts of the face and shadows that attracts observer can be useful in explanation of indescribable view of Mona Lisa smile. While designing periodontal treatment in aesthetically important areas, smile design should also be considered. Successful treatment outcome requires knowing interactions among all mouth structures including muscles, bones, gingival tissue, and occlusion. On the other hand, size, form, and position of the teeth and their relation with alveolar bone and gingival tissue have important role in smile designing (5). Smile line according to the visibility of dental and gingival tissue was classified as follows: 1) excessive smile or gummy smile: more than 2 mm of marginal gingiva is visible or more than 2 mm apical to the cemento-enamel junction is visible, 2) high smile line: between 0 to 2 mm of marginal gingiva is visible or between 0 to 2 mm apical to the cement-enamel junction is visible for the reduced perio-dontium, 3) average smile line: only gingival embrasure is visible, 4) low smile line: gingival embrasure and cement-enamel junction are not visible (6). Quite often, smile line 2 mm from gingival edge of the central incisors seems beautiful (5). Nonetheless, excessive visibility of gingiva may consider unaesthetic while smiling especially when gingival melanin pigmentation is not matched with facial color. Etiology for excessive gingival display consists of vertical maxillary excess, gingival hyperplasia (7), and delayed passive eruption (8). Excessive gingival display due to gingival hyperplasia or delayed passive eruption can be corrected through clinical crown lengthening (gingivectomy or periodontal flap), whereas vertical maxillary excess requires the extensive maxillofacial surgery. Oral cavity that is surrounded by lips constitutes the 1/3 of the space between nose and chin. Lip corners are along with pupils. Sensory innervation of this area is supplied by maxillary and mandibular branches of the trigeminal nerve. Vermilion forms the major anatomic features of the lips. From external view, muscle fibers of the lip are separated from epidermis by subcutaneous tissue. Main blood supply of the lips include upper and lower branches of the facial artery, which enters into upper and lower lips and forms vascular ring of the vermilion. Vertical grooves over middle part of the upper lip constitute the philtrum. Vermilion tubercle fills the area beneath the philtrum in the middle part of the vermilion. Symmetric curvatures between middle part of the vermilion and its adjacent skin create a bowl shape view (9). Philtrum is one of the most accurate landmarks for determination of the midline (5). Mild dislocation of the philtrum from midline can lead to the considerable inelegance in eyes. Tonus and form of vermilion, vermilion tubercle, and philtrum are mainly influenced by maxilla bone, periodontal anatomy, and morphology and position of teeth. Slight alterations in the color and depth of the lip shadows vitalize the lips. Shadows and their depth determine the lip span. Lower lip that directly receives light seems shinier compared with upper lip. On the other hand, lower lip usually seems redder due to the great blood supply. Distinguished features of the lower lip are not similar to the upper lip. There may be concavity or vertical groove in the middle area of the lower lip (9). Labial frenum is a mucosal fold that contains muscle fibers and attaches to the lip. This natural anatomic structure has a role in lip movement. Labial frenum attachment can affect upper lip form and teeth visibility (10). According to the result of a study, tonus of mentalis muscle decreases considerably following periodontal plastic surgery in patients with gummy smile and poor lip seal (11). Normal lip expressions are influenced by race and physiology, but facial expressions in happiness, sorrow, anger, fear, wonder, hatred, and enthusiasm are likely similar in all cultures (12, 13). In 1872, Charles Darwin published the first prominent study on the facial expressions. The results showed that main facial expressions including wonder, fear, shame, pride, hatred, horror, anger, love, joy, guilt, anxiety, timidity, and modesty are similar among people all over the world (14). Gingival color, form, and texture that are visible by other persons, provide pleasant appearance when are matched with skin, lips, and teeth features. Loose and shiny alveolar mucosa and pink coral attached gingiva are the most important components of the mouth mucosa. Position of the muco-gingival junction remains stable during life time, whereas width of attached gingiva increases with different amounts in various areas of the mouth (15, 16). Teeth growth is genetically continued until adulthood as are healthy gingiva and bone (15, 17). Width of the keratinized gingiva in maxillary incisor (3.5 - 4.5 mm) and mandibular incisor (3.3 - 3.9 mm) is maximum and decreases to 1.9 mm and 1.8 mm in premolar maxilla and mandible, respectively (16). Mobile alveolar mucosa is formed of loose collagen fibers. Alveolar mucosal epithelium is thin and nonkeratinized and lacks rete peg, whereas the attached gingival epithelium is thick, keratinized, and constituted from organized and compact collagen fibers (9). Gingival edge of maxillary teeth usually matches with upper lip margin. Gingival edge has a healthy periodontium 0.5 - 1 mm more coronal compared with cemento-enamel junction. Gingival edges of the maxillary canines and central incisors are in the same height. Gingival edge of the central incisors is 0/5-1 mm more coronal in comparison to the gingival edges of canines and lateral incisors. Cessation of apical migration of gingival edge leads to the appearance of short clinical crown and in case of high smile line, great amount of gingiva may be visible. In addition, gingival tissue would be visible if upper lip be thin or placed in a superior position. In these cases, the crown lengthening surgery can increase the length of the clinical crown of anterior teeth. Furthermore, this surgery is very effective in correction of symmetry and most apical point of gingival tissue along the longitudinal tooth axis (Zenith point) (18, 19). Naturally, position of the zenith point on the maxillary canines and incisors is more distal than longitudinal axis of the mentioned teeth, whereas this point is exactly placed on the longitudinal axis of the maxillary lateral incisors (20). In cases of the average smile line, tonus and position of the lip cause that 75 to 100 percent of the upper anterior teeth and soft tissue be visible. 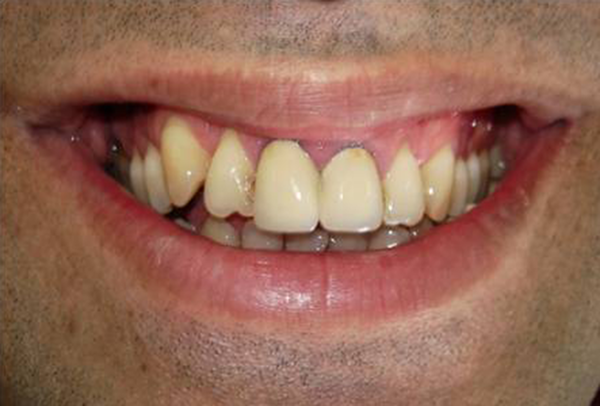 Correction of the width of gingiva can significantly change the smile (Figure 1). A, Pretreatment clinical view of smile in a 17-year-old female complaining of excessive visibility of gingiva and teeth shape while smiling. Patient with gummy smile and space between anterior teeth and cuneiform lateral incisors is obvious. B, Periodontal plastic surgery has been performed for correction of clinical crown length of the anterior teeth. C, Clinical view 1 month after surgery. D, Clinical view of smile after placement of the laminate. Gingival thickness, morphology of gingival contour, interdental papilla, and bone structure are all determinants of the periodontal biotype, and can influence surgery and repair methods. Range of the periodontal biotypes has been reported differently from thin and scalloped perio-dontium to thick and flat ones. Biotype I is described as thin gingival tissue with long-narrow papilla and thin scalloped alveolar bone. Thick gingival tissue with short and wide papilla and thick and flat alveolar bone are characteristics of biotype II. According to the epidemiologic studies, more than 85% of persons have thick and flat biotype and less than 15% have scalloped and thin biotype (21). Average of the width of the free gingiva is 1.56 ± 0.39 mm, while the width of attached gingiva is 1.25 ± 0.42 mm (18). Determination of the periodontal biotype practically has a useful role in all periodontal plastic surgeries, such as clinical crown lengthening, implant placement, and soft tissue grafting (19, 22-24). Thin biotype is the most sensitive biotype and gingival recession or black triangle view (in papilla area) may occur following surgery. In case of undiagnosed thin biotype, implanted root may become bare after soft tissue grafting. Grafted area may also suffer from the gingival recession or bluish tincture. Tooth shape is associated with periodontal biotype and this feature is more obvious in the anterior area or mouth static. In case of thin perio-dontium, teeth are usually bulbous and square, interdental contact area is more apical with short-wide adjacent papilla and teeth are also wide inciso-cervically and facio-lingually. In contrast, a tooth shape is thinner and somewhat triangular in thin perio-dontium. Moreover, the interdental contact area is more coronal with long and narrow papilla and teeth are usually narrow inciso-cervically and facio-lingually (18, 21). Based on the suggestion of Touati, each anterior maxillary tooth has a specific static role as follows: central incisors give stability and balance, lateral incisors create attractiveness and canines bring strength. On average, upper central incisors in males and females are visible at rest. The amount of incisal edge visibility decreases with aging (25). Generally, person seems happier and kinder when 3-4 mm of upper central incisors are visible at rest compared with 1-2 mm visibility of these teeth (5). Although human mind is convinced that each tooth is placed separately, generally, placement of teeth along each other in concordance with gingiva, lip, and other components of the face, is considered and perceived as a unit. A smile would have more pleasant effect on the observer if he is not influenced by the unexpected color or contour of teeth and gingiva (Figure 1). He may focus on the general features of the face or his imagination may disrupt him to notice the facial expressions and his assessment will be concentrated on the separate parts of the face. In the first condition, harmony and appropriateness remain but the second condition leads to the incoordination of the imagination toward the person. Focusing on the unimportant issues such as color change (Figure 2), tooth loss or fracture (Figure 3), and gingival recession or inflammation results in a disturbed imagination from a person (26). Teeth whitening regardless of color, shape, margin, lip texture, mouth mucosa, and skin will affect general facial expressions. Darkness of the lips, skin, and gingiva results in a brighter display of teeth and such opposition causes whiter appearance of the teeth. When also gingival color is brighter than oral cavity darkness, teeth seem brighter and more pleasant. Considerable melanin pigmentation in upper anterior gingiva can cause obvious color opposition in front of the white color and brightness of teeth. Periodontal surgeries, such as soft and hard tissue grafting and implant placement considering dental morphology can bring more beautiful smile to the patient (23, 24, 27, 28). Wilckodontics or science of accelerated osteogenic orthodontics is a periodontal procedure in which tooth movement is faster than conventional orthodontics (Figure 4) (29, 30). Steps of this technique include full thickness periodontal flap insertion, selective incomplete decortication of cortical plates with the simultaneous bone graft, and complete flap closure. A, Clinical view of smile. B, Mobile prosthesis view. Treatment duration decreased to less than 6 months using this method. A, Pretreatment clinical view of maxilla. B, After flap elevation. C, Grooving of interdental alveolar bone. D, Filling the area with bone graft material. E, Sutures. F, Posttreatment clinical view of maxilla. G, Pretreatment clinical view of mandible. H, After flap elevation. I, Grooving of an interdental alveolar bone. J, Filling the area with bone graft material. K, Sutures. L, Posttreatment clinical view of mandible. Features including height and facial alveolar plate contour can considerably affect lip morphology, facial expressions and smile. There are widespread differences of bone plate morphology (25). In many cases, bone correction is required to reach normal architecture and remove tissue step view (6). Dynamic balance between functional and anatomical forces of alveolar bone forms the alveolar morphology. Route, intensity, and duration of functional forces are shown in thickness and density of the bone. Both thickness and height of the facial alveolar plate are affected by angle between root and bone. Tooth inclination toward labial is associated with thin and scalloped facial alveolar bone that is placed in more apical position. Tooth inclination toward lingual is related to the flat and thick facial alveolar bone that is placed in more coronal position. Facial alveolar contour follows radicular surface prominence, and has vertical grooves in interradicular bone plates and there is notch on the bone plates in apical areas. An adaptation capability of alveolar bone to confront with muscular forces is seen in thickening of coronal zones of the facial alveolar plate. An increased vertical or horizontal dimension of the alveolar plate in the facial side as thick bone ledges and exostosis in more apical areas of radicular surfaces may be visible in overextended upper lip (31). Increased alveolar volume can move upper lip to the superior position while smiling leading to the considerable amount of gingival display. Standard measures, golden proportions (32), and symmetry are concepts that mostly applied for guidance of image designing. Nevertheless, aesthetic attainment is possible with the presence of different measures and proportions and symmetry or asymmetry. Specific mathematical measures and symmetry should not be considered as beauty criteria and the violation of computational formulas and asymmetry should not be introduced as inconsistency. Symmetric smile, which follows proved measures, is not necessarily aesthetic. However, measures, proportions, and symmetry are all aspects of beautiful art work but rarely suffice for attaining beauty phenomenon. In modern society, we insist on finding a form that follows determined rules. Medical and periodontics sciences can have rules in repair and reconstruction of the beauty and health by anatomic symmetric smile principles. Nonetheless, physicians may not be able to achieve beauty despite of applying most complete world standards. Countless individual differences in facial features lead to achieving countless outcomes in aesthetic proceedings. Eventually, individual’s kindness and personality can create a wonderful attraction while smiling that is unjustifiable. We would like to thank Dr. Frank Yorita (orthodontist, University of Southern California) and Dr. Niloofar Shademan (repair specialist, assistant professor at Kerman University) for providing figures. Authors’ Contributions: Study concept and design and acquisition of data: Hessam Nowzari. Analysis and interpretation of data: Sandra K. Rich. Drafting of the manuscript: Rahil Farahani and Maryam Johari. Critical revision of the manuscript for important intellectual content: Rahil Farahani. Statistical analysis: Maryam Johari. Administrative, technical, and material support: Neda Moslemi. Study supervision: Neda Moslemi.